Thought I'd kick-start my stay here at Chaosproject with a script. This is my fifth released CMS, and I have to say, I think it's my best yet. Plug-n-play, except the game name. Ctrl + f to search through the script for "Insert Name Of Game". Replace the text inside the quotation marks with the name of your game. If you can't see the font, download it, and put it in your computer's 'Fonts' folder. Any problems, or queries, reply here, or contact me via PM. The Active Command Menu looks marvelous. I love the symmetrical Pyramid feel to it. If I'm not mistaken, you can edit the font to your liking, am I correct? This is a simple assumption I am making. On the Active Status Window, the "======" look a little annoying. Can you modify this? If so, then that's A-OK. Overall, I love this CMS. I don't know if I'm using it in the future, considering I don't even have a project set up on RPG Maker XP yet. 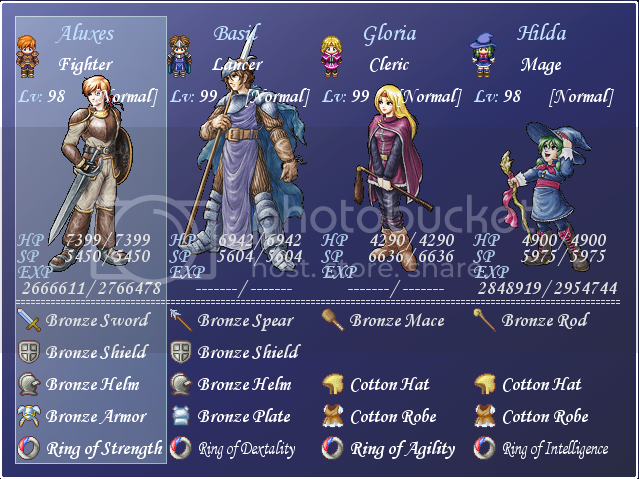 I put that there to separate the equipment and the other stats. Do you mean the font style, or the font color, etc? try putting an image there might look nicer or you could do two seperate windows but than u would have to modify other stuff more. It looks good maybe you could add an option to change the tone or opacity of the status when u have the command window active. It doesn't matter whether it's been the former or the latter you know. I just meant the Font Face, but Color is acceptable as well. The font face is changable, but the size will also need to be changed depending on the font you are changing to. The font color is also editable. 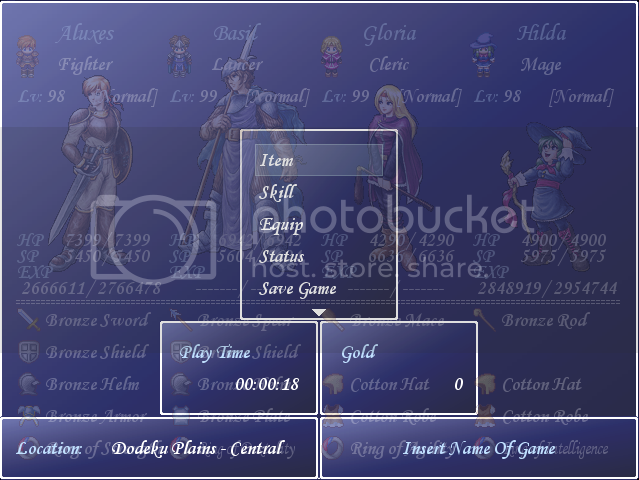 @Nortos - I may add two windows over the top of the status screen, thus splitting it up, with no further editing, though this may conflict with the cursor on the status window. Also, an image would be just as annoying as an army of '='s. Looks AWESOME, I'll try later if this works with my scripts! Again, that would still get as annoying as my multitude of ='s. instead of looking for each line thats 'Insert game here try using constants something like Game_Name = 'insert game here' then it would sorta be more plug in and play. Btw nice cms layout. That'd be pointless as you only have to change one string in the first place. Oh I through there was more lines that said it. I didn't get a chance to look at the script. Well, if it were me, I'd make that constant even if it's just one line. Not only for a public release, but even for my own use. In some other scripts I made, there are more constants in my script than in the one I post here. Mainly for easy cosmetic adjustment and convenience. I see. I may do that then. Its nice its just a bit extra :-\ if you know what i mean. Very flashy imo . But its nice ;D! I didn't take it as preaching at all. I took it as help and advice. Anybody got any other suggestions, problems, etc?